The TV talk show had run for 30 years. On its last episode, the band leader told the host, “Thanks for giving us a place to play our music for 30 years.” Christian marriages need a place to “play their music”, to be encouraged, challenged, to be recognized for the incredible phenomenon it is. In short, to be given visibility. 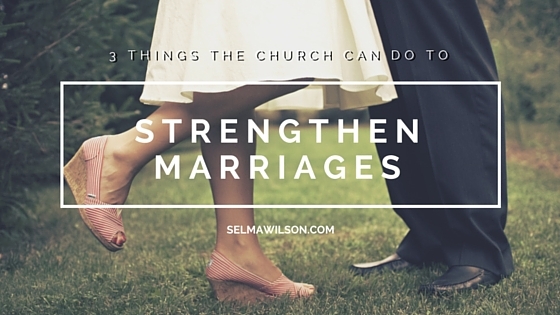 Here are three ways churches can strengthen marriages today while raising their visibility. Celebrate Marriages – Provide an environment where marriage is “cool”, talked about and supported. A celebration can be simple or elaborate. There are times when each type has its place. For example, recognizing someone’s 30/40/50 year marriage in a worship service can honor a long-term marriage while giving inspiration to the entire church. That’s simple. Then there are times when elaborate might be appropriate. Invite your married and engaged couples to dress up for a nice banquet-type meal and program. In this constantly casual era we live in today, such an evening could be a rare opportunity for some to dress really nice. Remind the husbands that their wives are worth it! Don’t get hung up on the size or how elaborate it is or isn’t. Concentrate on consistency so that your church is known as the church that celebrates marriage. 2. Resource Marriages – There was a time when marriage resources were scarce. Those days are gone. Long gone. There are books, blogs, websites, conferences and a myriad of other ways to access marriage ideas. As with many other subjects, trying to keep up can be overwhelming. Pray for and seek out a couple in your church with a strong marriage and a passion for marriages. Designate them as your “marriage enrichment resource couple”. They are assigned with the task of staying current on marriage websites, Christian marriage conferences, (Marriage Getaways, ex. ), books, etc. This couple can identify appropriate resources and periodically provide their new findings to the church staff who can publicize them to the people through their marketing channels (bulletins, church websites, church bookstores or libraries, etc.). Be the church in the know on marriage resources. 3. Counsel Marriages – From time to time, special attention needs to be given to hurting marriages. For a couple to seek counseling is often a difficult thing to do. Call it pride, embarrassment, fear of the unknown, whatever. Many couples suffer without help when counseling is available to them. Your church can create a culture where it is okay to seek help. The stigma of seeing a counselor doesn’t have to be what it was years ago. In the spirit of Proverbs 19:20 (“Listen to counsel and receive instruction so that you may be wise later in life.” HCSB) your church can affect this change. Shifting this attitude can lower the “difficulty level” of someone reaching out who desperately needs help. There are many different types of counseling of course. From formal or informal mentor couples, to couple teachers, to casual yet intentional conversations on marriage, to pastoral counseling in your church, to professional Christian therapists when needed, there are times when an “outside perspective” on a couple’s situation can be immensely beneficial. Make sure your church has the reputation of one who rushes to help marriages in need, whatever the extent. Seek to be known as the church that truly cares about marriage. What better place to honor marriage (Hebrews 13:4) than where people gather to worship its Creator? Do you Speak Your Mate’s Language? Thank you for your insight! These are great ways that the church can impact marriages. There’s a lot of pressure on marriages and anything the church can do to build marriages will ripple through families, communities, and the church itself. I love the thought of celebrating the marriages in your church. I know that most churches do a lot for the children and youth (as they should) but don’t have a lot of ministry for marriages. I may suggest this idea to my church. I know my wife and I would benefit from it.